The New Mexico Rail Runner Express (NMRX) is a commuter rail system serving the metropolitan areas of Albuquerque and Santa Fe, New Mexico. It is administered by the New Mexico Department of Transportation (NMDOT) and the Rio Metro Regional Transit District (Rio Metro), a regional transportation agency, while Herzog Transit Services currently holds the contract for the operation and maintenance of the line & equipment. Phase I of the system, operating on an existing right of way from Belen to Bernalillo that NMDOT purchased from BNSF Railway, opened in July 2006. Phase II, the extension of the line to Santa Fe, opened in December 2008. ‹The template Stnd is being considered for deletion.› Sandia Pueblo and ‹The template Stnd is being considered for deletion.› Zia Road. Peak ridership took place in 2010, and has since declined each year. It now does about 2,200 one-way passenger trips per day. The concept of passenger rail serving the Central New Mexico corridor had been discussed for decades, but it wasn’t until August 2003, when New Mexico Governor Bill Richardson announced that his administration was going to pursue the implementation of commuter rail service, that a serious effort got underway. Later that same year, grants were given to NMDOT and MRCOG to begin the effort, and the New Mexico State Legislature passed Governor Richardson’s Investment Partnership (GRIP), a transportation improvement package with the Rail Runner included as one of the bill's projects. Over the next few years, NMDOT and the Mid-Region Council of Governments (MRCOG) developed a strategy for implementing the rail service. In 2005, a name and a branding scheme was chosen. The name “Rail Runner” is a play on the name of New Mexico’s state bird, the roadrunner. The cars and locomotives were received throughout the year of 2005 and groundbreaking for the first Rail Runner station took place on October 31, 2005. During this time the state also conducted negotiations with BNSF over the use of the railroad track. After assessing the needs of the track, the state of New Mexico committed to purchasing the railroad corridor from Belen to the New Mexico-Colorado border from BNSF (although, thus far only the portion between Belen and Lamy, NM has been purchased), to ensure that commuter trains would always get the right-of-way and have priority over freight trains in the corridor. While the engines are capable of 110 miles per hour (180 km/h), the track limits the maximum speed to 79 miles per hour (127 km/h). The Rail Runner officially went into service on July 14, 2006, serving the Downtown Albuquerque, Los Ranchos, and Sandoval County stations. On December 11, 2006, the Los Lunas station opened, and on February 2, 2007, the Belen station opened, extending the line to its southern end. In April 2007, two more stations opened: Bernalillo County/International Sunport on the 20th and Downtown Bernalillo on the 27th. On December 17, 2008, the Isleta Pueblo station opened. Phase II, the extension of the line to Santa Fe, opened for service on December 17, 2008. Using the existing Santa Fe Southern Railway track from Lamy to Santa Fe, which is filled with sharp curves, would have required the train to slow to 15 miles per hour (24 km/h) in some places, so new tracks were laid to allow travel times comparable to the automobile. The route uses previously existing track from Bernalillo to the base of La Bajada, a hill south of Santa Fe. It then runs on newly built track on a new right-of-way from CP Madrid, for five miles and then in the I-25 median into Santa Fe, at CP Hondo, where it uses an improved Santa Fe Southern Railway track from I-25 to the terminal at the Santa Fe Railyard. Two of the planned stations for the Phase II extension opened on December 17: the South Capitol and the Santa Fe Depot stations. A third station at the NM 599/I-25 interchange in Santa Fe County opened on August 1, 2009. After the opening of the Phase II stations, several more stations opened. Sandia Pueblo station, serving Sandia Pueblo, opened on August 29, 2011. The last planned station in within Bernalillo County, the Montaño station, officially opened on April 7, 2014. Kewa Pueblo station, serving Santo Domingo Pueblo, opened on March 22, 2010. It is the first station beyond the original 13 planned stations to reach the construction stage and was built using stimulus funds. On September 12, 2009, a special events platform opened for Lobo games service only. At the end of March in 2014, the Rail Runner added security officers to the system. Officers are charged with protecting the trains, inspecting fares, and addressing issues at the stations and parking lots. The wearing and use of lapel cameras during incidents is also required. Construction of the platform at the Zia Road station, the last of the four planned stations for Phase II, was completed several years in advance of the station's opening in April 2017. The central New Mexico corridor, which is home to half the state’s population, contains Santa Fe, the state capital, and Albuquerque, the largest city and economic hub of New Mexico. The two cities are connected by I-25, an increasingly congested four-lane rural freeway that roughly parallels the route of the Rail Runner. Alternate routes are longer or otherwise constraining. Within Albuquerque's metropolitan area, the heavily urbanized parts of Valencia county are separated from Albuquerque by Isleta Pueblo. Another four Native American pueblos are traversed by the Interstate Highway to Santa Fe, making the addition of new roadways or the expansion of current capacity financially and politically challenging. The high real-estate prices in Santa Fe mean that many of the people who work there commute from the Albuquerque metro area. Furthermore, the capital is home to many of the state’s cultural institutions and tourist attractions, and most out-of-state visitors are forced to make the 60-mile journey from the Albuquerque International Sunport by car. As the population of the region grows, commute times are expected to increase 80% on some routes by 2025, making the introduction of additional forms of transportation a priority to local governments. The cost of the Rail Runner system was $135 million for the first phase and around $250 million for the second phase. Preliminary estimates indicated that the service would operate at a deficit, requiring up to $10 million in government funding annually. In late 2007, the Rail Runner was the subject of more criticism as a transportation funding shortfall left many state road projects stalled. State officials said the rising cost of construction materials and decreased federal support were the cause, but some lawmakers cited the cost of the Rail Runner as a contributing factor for the shortfall. Supporters of Rail Runner funding note that roadways and other infrastructure for passenger cars also operate at a deficit, requiring government funding for construction, operation, and maintenance. The capital costs of the Rail Runner project were covered by state and local funds. Funding for operations of the system in its first few years was covered largely by federal Congestion Mitigation and Air Quality Improvement (CMAQ) Program funds, along with ticket revenues and some state and local funds. Operational costs were expected to rise from $10 million for the first phase to $20 million after completion of the second phase. Federal funding for the Rail Runner is expected to stop in 2009, and without sufficient funds from other sources would leave funding for the operational and maintenance costs for the system up in the air. To prevent a funding shortfall, local and state governments began looking into possible taxes in the counties the Rail Runner serves. Two separate gross receipts taxes for regional transit were approved by voters in central and north-central New Mexico in November 2008 and will cover a large portion of the operational funds of the Rail Runner. Additional funds will also come from bond revenue and money appropriated by the New Mexico State Legislature. On service between Albuquerque and Bernalillo, fares were initially free to attract ridership. On its first day of service, the Rail Runner carried 4,122 passengers. During the initial free period, ridership averaged 4,000 to 4,500 riders per day with a one-day peak of 6,000 riders. Ridership gradually declined during the weeks of free service. Ridership averaged 2,500 to 3,000 riders per day in August 2006, and 2,100 to 2,500 riders per day in September 2006. In November 2006, free service ended on the line's Sandoval section, and ridership fell to 1,000 passengers per day. When the Los Lunas and Belen stations opened with free service, ridership rose to around 1,800 passengers per day. Free service on the Belen section of the line ended April 1, 2007, and a new zone fare structure went into effect. During the summer of 2007, ridership averaged 2,500 passengers per day. By April 2008, weekly ridership was 9,600. On June 26, 2008, the Rail Runner passed 1 million passengers. On December 17, 2008, service to Santa Fe started with a three-month period of free service for Santa Fe County residents and three weekends of free service for the whole system. The original 2005 projected ridership for a slightly different (but similar speed) Phase II route to Santa Fe was 2,954 daily riders. During the first full week of train service between the two cities, more than 33,000 passengers boarded. On the second Saturday of service to Santa Fe, nearly 12,000 people boarded trains between Belen and Santa Fe. Weekend service, which was to be discontinued after the first three weekends of service to Santa Fe, was instead partly retained, with permanent Saturday service. Ridership for the first few weeks of Santa Fe service averaged about 5,000 riders per day, then dropped to an average of around 4,000 riders per day for the month of January 2009. Ridership continued to increase through 2010, reaching a peak of 1.24 million passengers annually (4,000 on an average weekday). Since then, passenger numbers have continued to decline year-over-year to a low of under 800,000 in 2018. Government analysts blamed the drop in ridership on low gas prices, infrequent service, and long travel times, and recommended that the state focus on making the service more competitive with car travel. It was also suggested that service to the Downtown Bernalillo station be reduced or eliminated due to low ridership. The Rail Runner operates seven days a week. The goal is to provide alternative transport for commuters, visitors, and vacationers from Belen to Santa Fe. The current weekday schedule is 11 northbound trains. Three trains from Belen-Santa Fe stop at all stations, while a morning express train skips over Sandia Pueblo and Downtown Bernalillo. Three trains depart Belen-Albuquerque, and four trains depart Albuquerque-Santa Fe. Rio Metro operates a bus from Belen to Albuquerque in the morning that makes stops at each Rail Runner station. The Saturday schedule has four northbound trains from Belen-Santa Fe throughout the day, and one final train in the evening from Belen-Albuquerque. Trains stop at all stations. The Sunday schedule has three Belen-Santa Fe trips, also stopping at all stations. The weekday schedule heading south has a total of 11 trains. There are four trains from Santa Fe-Belen, three trains that make all stops from Santa Fe-Albuquerque, an evening express train that makes limited stops from Santa Fe-Albuquerque, and three trains from Albuquerque-Belen. Rio Metro operates an express bus from Sandoval County/US 550 to Downtown Albuquerque in the morning, and another bus from Albuquerque to Belen, making all stops at Rail Runner stations. Saturday trains are scattered throughout the day, with three trains from Santa Fe-Belen, two trains from Albuquerque-Belen, and a final evening train from Santa Fe-Albuquerque. Sunday trains are also limited, with two Santa Fe-Belen trains, one Albuquerque-Belen train in the morning, and a final evening train from Santa Fe-Albuquerque. During government holidays, the Rail Runner will either operate on a regular schedule, a Saturday schedule, or will have no service. Days surrounding holidays (such as Christmas) will usually see normal weekday service. Special schedules, such as the New Mexico Wine Festival, will use a Saturday schedule, but with added trains. The Balloon Fiesta is another event in which the Rail Runner does not add extra trains, but provides free shuttles to riders from the Los Ranchos/Journal Center Station to Balloon Fiesta Park and back. For four months in 2009, Rail Runner operated game-day trains to sporting events to Lobo Station. After a cumulative total of 227 passengers made use of Lobo, the game-day train service was discontinued and Lobo Station was permanently abandoned. The cost of Rail Runner tickets is based on the number of zones the rider will be travelling through. There are a total of six zones. Tickets can be purchased online at a discount, and then printed or sent to a phone (E-Ticket), which will be scanned by a hand-held reader by a Rail Runner agent. Tickets can also be purchased on the train using cash or certain types of credit cards. In addition to the reduced fare, which is available to 10-17 year-olds; students with a valid student ID; seniors 62 years or older; individuals on medicare with proper identification; and people with disabilities. Additionally, there are special promotions throughout the year, such as seniors riding for free every Wednesday through the summer. Tickets that were printed at home or on the train are eligible to receive free transfers to ABQ RIDE, Rio Metro RTD, North Central RTD, Santa Fe Trails, and Santa Fe Pick up. E-Tickets are not accepted on buses. The Rail Runner power includes nine Motive Power MPI MP36PH-3C diesel-electric locomotives that operate on diesel fuel. The use of biodiesel fuel is under investigation. Passenger cars include thirteen Bombardier BiLevel Coaches and nine Bombardier BiLevel Cab cars. Coach cars have a seating capacity of 151 passengers while cab cars have a seating capacity of 141 passengers, with each type of car having standing room for an additional 60. Rail Runner trains operate in a push-pull configuration, with the locomotive always facing south. When not in use, the vehicles are stored in a railyard in Downtown Albuquerque, located across the main rail line from the Alvarado Transportation Center. The AAR reporting mark for the Rail Runner Express is NMRX. Locomotives have three-digit road numbers beginning with the numeral 1 (e.g., 101). Coaches have four-digit road numbers beginning with the numeral 1 (e.g., 1001). Cab cars have four-digit road numbers beginning with 11 (e.g., 1101). Restrooms and water fountains are available in the cab cars. Bicycle and wheelchair securement areas are on the first level of all coaches. 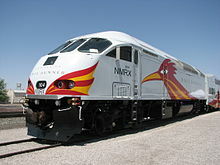 The livery of the New Mexico Rail Runner depicts a stylistic roadrunner on the locomotive and trailing tailfeathers on the coaches. The "door closing" tones resemble the signature “Beep-Beep” of the Warner Bros. Road Runner cartoon character. The Rail Runner connects with Amtrak and Greyhound Lines at Downtown Albuquerque. NMDOT Park and Ride shuttles connect the Downtown Albuquerque station to Moriarty, the NM 599 station to Los Alamos and southern Santa Fe, and the South Capitol station in Santa Fe to the communities of Los Alamos, Española, and Las Vegas. Park and Ride passengers with a systemwide monthly pass can ride the Rail Runner for free. There are connections to numerous ABQRide routes (including Rapid Ride) in Downtown Albuquerque as well as ABQRide routes at the Los Ranchos/Journal Center, Montaño, and Bernalillo County/International Sunport stations. ABQRide offers free service to anyone who shows their Rail Runner ticket. In Santa Fe, Santa Fe Trails' bus routes, a city government shuttle, and a Department of Transportation shuttle provide local connections at the South Capitol and Santa Fe Depot stations on which Rail Runner passengers also receive free transfers. There are also a number of smaller shuttle services serving the Rail Runner: a shuttle to Socorro and through Belen serves the Belen station, Los Lunas Public Transportation serves the Los Lunas station, the Sandoval Easy Express serves the two stations in Bernalillo, the University of New Mexico has a dedicated shuttle connecting its main campus to the Downtown Albuquerque station, a shuttle to Taos serves the Santa Fe Depot and South Capitol stations, and Santa Ana Pueblo, Isleta Pueblo, and Pojoaque Pueblo each operate shuttles connecting their casinos to the nearest Rail Runner station. Other stations within the current route have been proposed, and some have been approved. A station has been proposed by tribal leaders and state government in San Felipe Pueblo. The Environmental Assessment for Phase II considered placement of a station between Cerrillos Road and Richards Avenue in the I-25 Median; it concluded that there was not yet enough demand, but recommended that it be considered for the future. Currently, a proposed station near the Las Soleras development has been approved and is now under study. An extension northward to Taos has been discussed, however a memorandum to study the feasibility of doing so died in the 2009 New Mexico State Legislative Session. There is now a shuttle service from Taos to the Santa Fe Rail Runner stations. Extension of the Rail Runner south to Las Cruces and El Paso has also been discussed. A memorandum to study the feasibility of such service was introduced and was amended to study Las Cruces-El Paso service, but failed to pass in the New Mexico Legislature. A house resolution was introduced by Congressman Harry Teague in May 2009 to study the concept. However, this resolution never came out of committee and by default was cleared from the Congressional books. In 2007, on April 5, a northbound train ran through a wildfire on the Isleta Pueblo reservation. No one was hurt and no equipment was damaged, but officials soon tried to find out why no one received notification of the blaze until the incident actually occurred. On the evening of August 24, a southbound train hit a vehicle at a private grade crossing south of Los Lunas. Two people in the vehicle were killed. No one aboard the train was injured. It appears that the Rail Runner personnel followed procedure. On the evening of September 19, a southbound train hit a vehicle at a private grade crossing between Belen and Los Lunas. One person in the vehicle was killed. In 2008, during the early evening of May 14, in an apparent suicide, a man was killed after being struck by the Rail Runner as he was sitting on the tracks. On the evening of December 17, the inaugural day of service to Santa Fe, a southbound Rail Runner train struck a cow near San Felipe Pueblo. In 2009, on the morning of March 10, a southbound Rail Runner train struck an abandoned car in the South Valley. On August 18, a northbound train was struck by a car which drove into the side of the train; the driver was killed. On December 17, 2010, a northbound Rail Runner struck and killed a man. In 2011, on February 2 and 3 due to very cold temperatures (-18F) tracks cracked and needed to be repaired. This caused restricted speeds and significant delays. In 2014, on April 14, a southbound Rail Runner train struck and killed a 67-year-old woman in southern Albuquerque, just south of the Bernalillo County/International Sunport station. Passengers on the train were taken to their destinations by bus. Six days later, a 60-year-old cyclist was killed by a southbound train in Santa Fe. Santa Fe Trails, the local transit agency in Santa Fe, provided bus service to all stations south for stranded passengers. Although the Santa Fe area is a quiet zone, witnesses reported that the train was sounding its horn prior to the crossing. On October 10, A Rail Runner train struck a vehicle that was attempting to go around the crossing gates, killing two people. The train had departed the Bernalillo County/Int'l Sunport station and was heading south. No one on board the train was harmed. On September 11, 2017, a northbound train, the first of the day, struck and killed a man, in an apparent suicide. ^ Transit and Rail Division (PDF) (Report). New Mexico Department of Transportation. January 2017. p. 13. ^ "News Release on Rail Runner website". Archived from the original on 2010-11-27. Retrieved 2009-09-12. ^ a b "Rail Runner Express Gets Rollin' for the First Time on Trial Trip". The Albuquerque Journal. 2006-04-19. Retrieved 2009-04-25. ^ "Stations". New Mexico Rail Runner. Retrieved 2008-03-18. ^ "Santa Fe Fares & Zones" (PDF). New Mexico Rail Runner. Retrieved 2008-12-03. ^ MORGAN LEE (21 July 2016). "Slumping ridership dogs Rail Runner". Albuquerque Journal. Retrieved 19 February 2019. ^ "Commuter Rail Status Report: "Belen to Santa Fe Commuter Rail Overview"". Archived from the original on 2007-08-08. Retrieved 2006-11-19. ^ ""Rail Runner Route to Santa Fe" page on Rail Runner website". Archived from the original on 2008-05-13. Retrieved 2008-05-18. ^ "Sandia Pueblo Rail Runner Stop Opens". Retrieved 2011-10-05. ^ "New Mexico Rail Runner Express Completes Lobo Special Events Platform". UNM Today. Archived from the original on 2010-08-12. Retrieved 2009-09-12. ^ "Security Officers on the Rail Runner". Retrieved 2014-04-21. ^ "Rail Runner security boosted". Albuquerque Journal. Retrieved 2014-04-21. ^ ""Zia Road Station" page on Rail Runner website". Archived from the original on 2008-12-03. Retrieved 2008-12-04. ^ "Commuter Rail Status Report: "Transportation Issues in the Albuquerque to Santa Fe Corridor"". Archived from the original on 2007-08-08. Retrieved 2006-11-19. ^ "Commuter Rail Status Report: "Regional Context" and "Transportation Issues in the Middle Rio Grande Valley"". Archived from the original on 2007-08-08. Retrieved 2006-11-19. ^ "Funding page on Rail Runner website". Archived from the original on 2008-05-13. Retrieved 2008-06-02. ^ "Train Debate Ignores I-25 Funding Needs". Albuquerque Journal. Retrieved 2006-11-18. ^ "Lack of funds has N.M. road projects on hold". Albuquerque Tribune. Archived from the original on 2007-12-13. Retrieved 2007-12-08. ^ "Why light rail makes sense". Socorro News. Archived from the original on 2008-08-28. Retrieved 2008-01-21. ^ "A referendum on the Rail Runner". New Mexico Independent. Retrieved 2008-09-02. ^ "Transit tax passes in 7 New Mexico counties". MSN Money. Archived from the original on 2007-03-08. Retrieved 2008-11-05. ^ a b "Transit and Rail Division Fact Sheet" (PDF). New Mexico Department of Transportation. February 2019. Retrieved March 10, 2019. ^ "Story: Stats don't faze train managers". Albuquerque Tribune. Archived from the original on 2007-09-29. Retrieved 2006-11-18. ^ "Fewer people are riding the Rail Runner for fun". Albuquerque Tribune. Archived from the original on 2006-11-30. Retrieved 2006-11-18. ^ "Gas Prices Increase Rail Runner Ridership". KKOB News Radio. Archived from the original on 2011-05-25. Retrieved 2008-04-30. ^ "Rail Runner celebrates 1 million riders". KOB-TV. Retrieved 2009-06-26. ^ "Rail Runner Ridership Down". Albuquerque Journal. Retrieved 2009-01-27. ^ McKay, Dan (January 14, 2019). "Train ridership continues to fall in New Mexico". Albuquerque Journal. Retrieved March 10, 2019. ^ "Rail Runner for Balloon Fiesta Weekends". KRQE. Archived from the original on 2013-12-11. Retrieved 2013-12-06. ^ "Rail Runner Fare Chart" (PDF). Archived from the original (PDF) on 2015-09-14. ^ MacEachen, Brandon. "Rio Metro Regional Transit District Official Site - Seniors Ride Free Through the Summer!". www.riometro.org. Archived from the original on 2017-02-10. Retrieved 2017-05-04. ^ "Train Equipment page on Rail Runner website". Archived from the original on 2008-02-18. Retrieved 2008-02-02. ^ "Car Specifications on Rail Runner website". Archived from the original on 2011-07-26. Retrieved 2009-12-19. ^ "Proposed Rail Runner Station at Las Soleras" (PDF). Archived from the original (PDF) on 2010-11-27. Retrieved 2010-06-02. ^ "Railroad fire plan not followed". KRQE News 13. Archived from the original on 2007-04-10. Retrieved 2017-06-12. ^ "Delays, struck cow mark Rail Runner's first day, but riders optimistic". Santa Fe New Mexican. Archived from the original on 2012-09-08. Retrieved 2008-12-17. ^ "Rail Runner strikes, kills man walking along tracks". KOB-TV. Archived from the original on 2010-12-22. Retrieved 2017-06-12. ^ "Sub-zero temps crack rails, delay Rail Runner trains". Santa Fe New Mexican. Archived from the original on 2012-09-12. Retrieved 2011-02-04. ^ "Pedestrian killed in Rail Runner crash identified". KOAT. Retrieved 2014-04-21. ^ "Cyclist killed after collision with Rail Runner". KRQE. Retrieved 2014-04-21. ^ "2 killed in South Valley Rail Runner collision". Albuquerque Journal. Retrieved 2014-10-10. ^ ""Rail Runner traffic delayed by apparent suicide"". The Santa Fe New Mexican. Wikimedia Commons has media related to New Mexico Rail Runner Express.